The MLB At Bat app for iPhone and iPad has been updated to add some nice features today. The iPad app gets a gorgeous new overlay which puts Gameday data right on top of your live broadcast. This is a fantastic improvement to the previous behavior, which allowed you to watch either the broadcast or the data but not both. This enhances the viewing experience massively, putting all of the stats and near realtime pitch data at your fingertips. It also gets integration with Ford’s SYNC system, which will let you get scores, schedules, live audio and broadcast feeds through AppLink. In addition to SYNC, the app has been updated to add video highlight sharing via Facebook, Twitter, iMessage and email, but only on the iPhone. The MLB At Bat app has been downloaded over 5M times in 2012 and should reach the combined total of 2010 and 2011’s 6M by the end of the year. The app is one of my favorites. You can tell that the team respects baseball, but also loves building great apps, something that you just don’t find in a lot of sports apps. 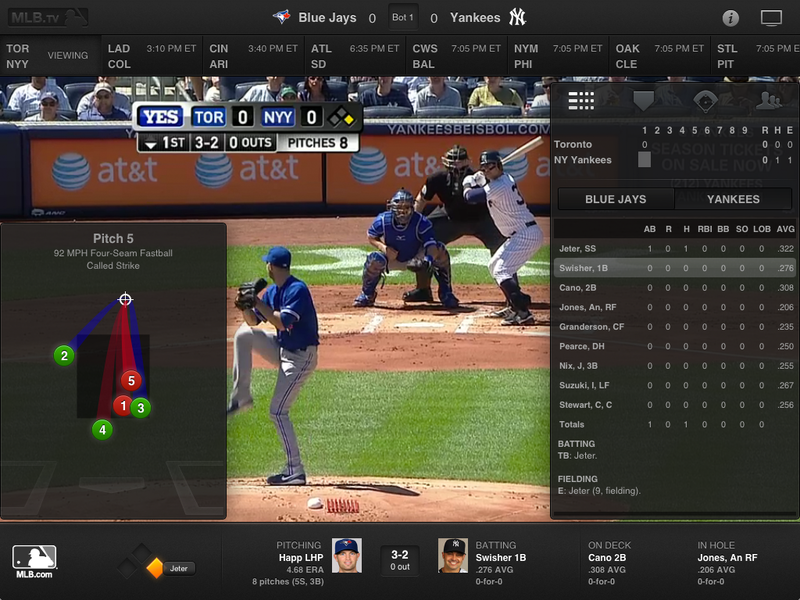 At Bat is s a joy to use, far surpassing the TV watching experience for me.